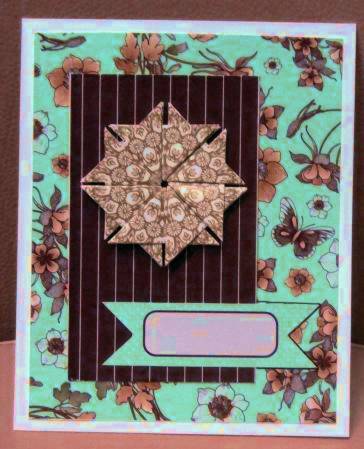 I decided to go all flashy with this teabag folding and paper embroidery card. I started with a medallion made of wrapping paper - cream, printed with gold and black. It also has more of a fancy fold, adding to the glamour. 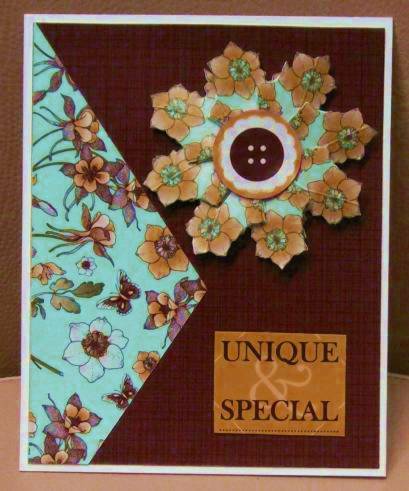 I chose a shiny gold metallic cardstock to stitch on and worked the design in black and brown threads. A metallic brad holds the medallion in place and I added sticky back rhinestones to every other scallop. So hard to photograph shiny metallics! 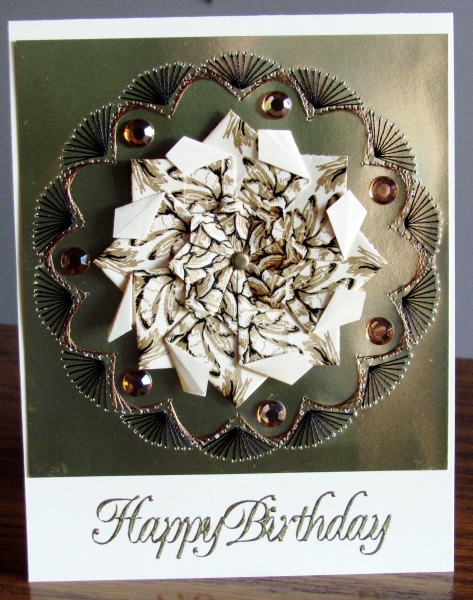 I used a cream base card to match the medallion and added a gold Dazzles sentiment sticker to the bottom. 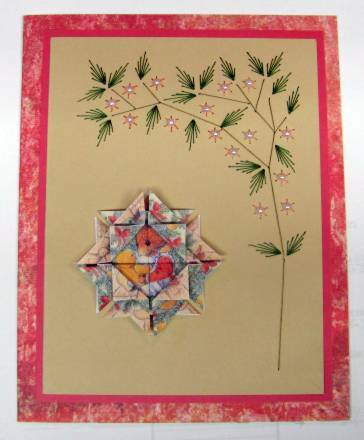 I think this teabag folding card with paper embroidery looks almost quilted. It must be the way the stitching looks like a Texas Star quilt block. I didn't have a cream colored thread to match the medallion so chose to use something that would echo some background lines in the paper. This border is a little small for the medallion but the way I arranged them in layering makes it look planned. I used some sticky backed tinted teardrops around the border to pull in more blue and they show up better than I expected on the dark blue background. 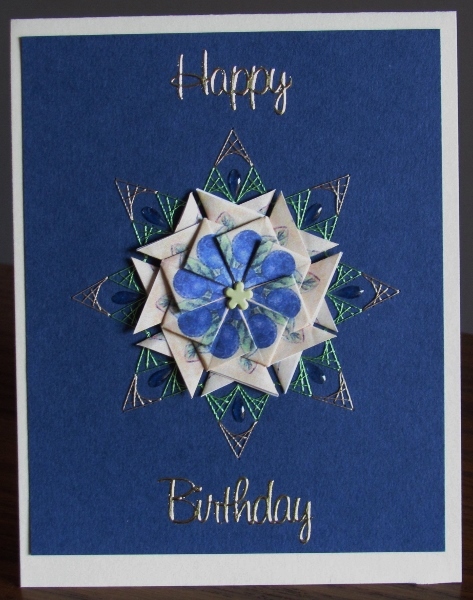 I went with a cream card base to feature the medallion more and mounted it with a single brad. I cut apart a Dazzles gold sentiment and mounted half at the top and half at the bottom. 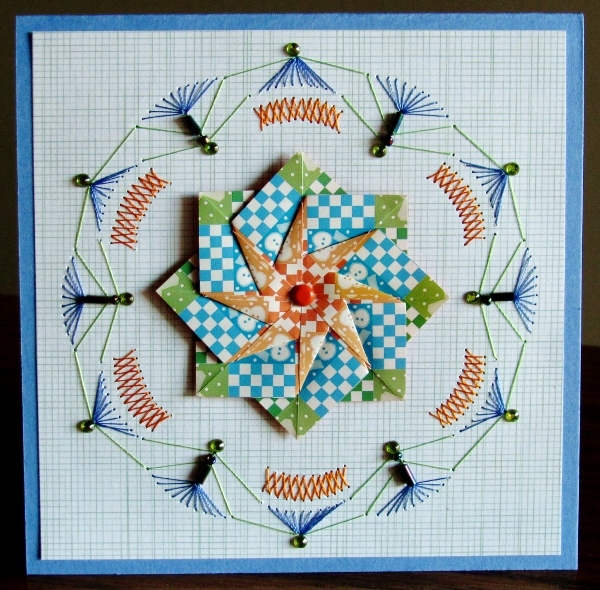 Here is another of the four cards I made combining teabag folding and paper embroidery. I guess that means "If I had it all to do over again, I wouldn't"! I haven't done teabag folding for oh so long! 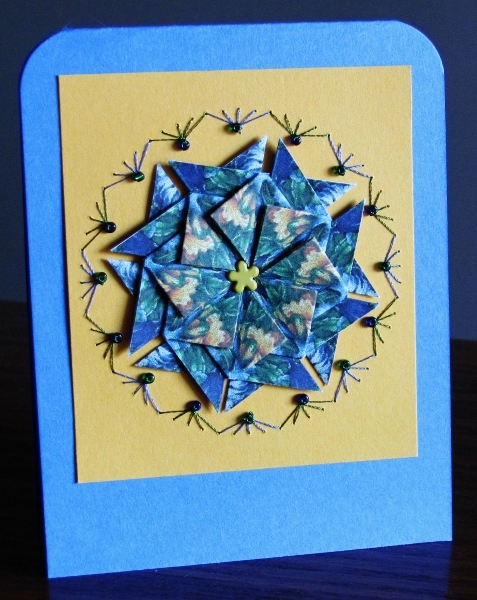 But I joined in a swap for cards that combined teabag folding and paper embroidery and needed to fulfill that challenge. I couldn't decide between four different units so I went through my patterns and chose different borders for each of them, matched up papers and threads and jumped right in. I used to do most of my stitching on the road (hubby driving) but we haven't been driving as much. This cut into my stitching time! Fortunately we had a road trip scheduled so I packed up my kit and soon had all 4 borders stitched. This first one is what I finally selected to send for the swap - it's headed off to The Netherlands. The medallion was tri-colored and I wanted to use all of those colors in the embroidery. I think this pattern is marked Linzoos but I have no idea where I got it, other than it was free online. I chose a paper that looks like gauze and stitched up all the embroidery. The pattern calls for rice beads but I don't have any so I used bugle beads instead. I added matching seed beads and sticky back rhinestones. The teabag fold is held in place with ATG tape as well as a single brad. After stitching I added stick-back pearls to the centers of the flowers. 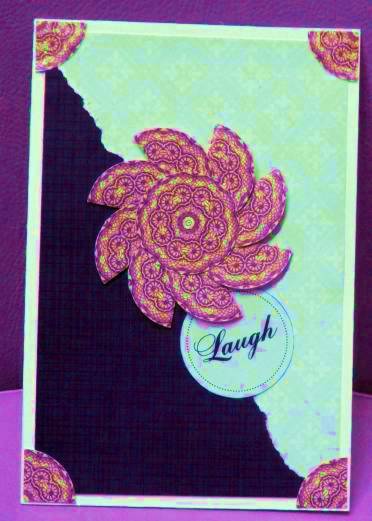 I had this teabag fold already done and used two layers of pink cardstocks to bring out the color of the flowers. Been a L-O-N-G time since I did teabag folding. For a friend who teaches quilting and loves cats, I created this card using 6 patterned papers and a teabag folding technique. Each of the blocks has a little punch of a plaid cat in the center. The quilt got a coordinating sashing around the outside and is mounted with pop-dots on a text-printed cardstock with corners rounded. 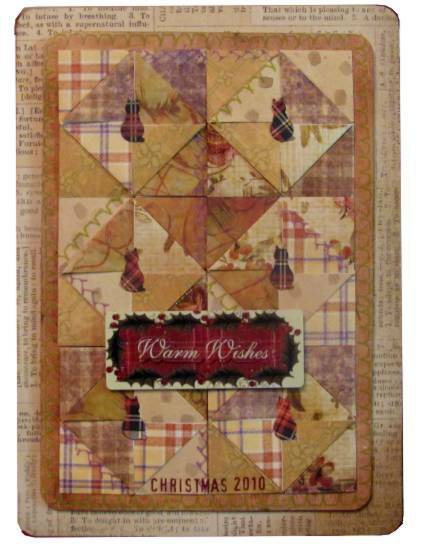 I used rub-on 'stitches' on random places on the quilt and completely around the sashing. The date at the bottom is also rub-ons and the greeting is a premade tag. This teabag was cut around the flowers before assembly for a decorative edging. The button is a die-cut. Again, this is severely color edited. More teabag folding, this with square tiles using a simple pyramid fold. When I am ready to send this one out, it will get a peel-off greeting inside the die-cut banner. The colors on this are not a bizarre as they look here, I have done color editing to obscure the actual papers used as they were part of a product notyet released. I haven't done anything with round teabags for years. This is a simple half-fold and I added one of the teabags to the center, as well. Another circle was cut into quarters to serve as corner backets.